The Church is Christ’s Bride, Not His Baby Mama. In case you are not up to speed on the last decade’s slang, a baby mama is someone with whom you made a baby, but have no commitment to and little contact with. In other words, someone objectified, used, abandoned, and now mocked for being dumb enough to think the guy would actually be faithful to her. If you are a Christian does that remind you of anything? I hear similar attitudes towards the church expressed in Starbucks every week. People waxing eloquent about how into ‘Jesus’ and ‘spirituality’ they are, but not so much ‘religion’ or the ‘Church.’ It is why 24 million people watched Jefferson Bethke’s spoken word video “Why I hate religion but love Jesus” last year. Checking to see if the “good preacher” is on before going. Having one church for worship, one for small groups, and one for preaching. Changing churches because you just aren’t “feeling it” anymore. Driving so far across town for a church you like that your unchurched friends would never think of coming with you. Picking your church, not on beliefs, but simply because your friends all go there. Criticizing the church you didn’t go to from Starbucks on Sunday morning. For the love, have we lost our ability to pick something and stick with it! I get that the church has earned its negative reputation. We have often behaved badly. I get that the church has been irrelevant, unloving, unhelpful and invested more in carpet than cast-offs. Surely the church has often behaved as Hosea’s harlot wife, but even so, she is still Christ’s bride and the mother of believers. To quote Tony Campolo’s misquote, “The church may be a whore, but she’s my mother.” Even gangsters have their mother’s backs. It is why “mama” jokes don’t play in the ‘hood. But the church isn’t a baby mama, even with her all her problems she is the spotless bride of Christ. Bridal imagery, by the way, is all over the New Testament. The church as Christ’s bride was a common image in the early church and remains such to groups with higher ecclesiologies (like Catholics, Orthodox and Anglican). The other feminine image of the church, the church as our mother, is largely from the early Christians, although it too has roots in Scripture. What we have done, perhaps as an unintended consequence to the Reformation meets American pragmatism and individualism, is created a religion of me, by me, and for me. Our most holy Trinity of me, myself and I. The motherhood of the Church, showing her as a birthing and nurturing institution, bearing fruit in many “sons of God,” and the bride-hood of the Church, portraying a union with her bridegroom, are not just nice metaphors. They are necessary to understanding our right place in the cosmos as God’s children. The church needs us. It needs us to repent of our philandering and commit to her. It needs us as insiders, not as onlookers; As her children, rather than a cheap and unfaithful lover ever looking to move on to his next conquest. There is a name for people with the most baby mama’s: Big Poppa’s. Here is a website devoted to the professional athletes with the most children by the most women: http://www.complex.com/sports/2012/06/big-poppa-the-athletes-with-the-most-children-by-the-most-women/ Enjoy watching New York Jets, Antonio Cromartie try to remember all of his kids names. A friend, Dave Wright blogged about this recently at fusionmusing.blogspot.com The posts are under “Youthministry and church” 3 posts about a field trip to an exceedingly cool church sporting 1970’s psychedelic secular rock and very funny preaching. Wrongly attributed to Augustine by Tony Campolo in Letters to a Young Evangelical. See, for example: 2 Cor 11:2; Eph 5:21-33; Rev 19:7; 21:2, 9; 22:17. Augustine: Big Man Meets Bigger God. 354-430 C.E. Yesterday was the feast of St. Augustine of Hippo, Great Doctor of the Western church. Long considered the greatest ancient mind in the Western world, Augustine is out of favor right now in Christian circles. Being asked to sum up Augustine’s life, teaching, theology and ministry in 5 minutes is a bit like being told that I need to drive a semi through my cat door…it won’t fit and the attempt is liable to make a mess of things. I will start the way Mark starts his Gospel-by skipping the first 30 years. We pick up Augustine’s story mid-stream: Augustine is 30 years of age and already has the most prestigious academic job in the Roman world: Professor of rhetoric for the imperial court in Milan. It was a position that brought with it a sure career of prominence in Roman politics. Being a prominent up-and-comer has never been good for one’s sense of spiritual need, and as such, Augustine came resistantly to faith. He was having too much fame and fortune and enjoying all of the “fun” that comes with. However, he had a praying mother and a friend of faith, Ambrose, who was a challenge to his intellect. They were God’s tools to break his defenses. Who is God using to break yours? So eventually the Big man met He-who-will-not-be-avoided. 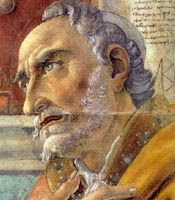 Augustine had his familiar conversion experience alone in his backyard at 33, after much influence by St. Ambrose (another rhetorician and Archbishop of Milan). At 37 Augustine was ordained to the priesthood. At 41 he was made bishop of Hippo, an African backwater and a diocese considered far beneath a person of his aptitude and potential. Far from being buried in obscurity, however, over the next 29 years Augustine would become the most towering Latin writer, extraordinary in both scope and depth. Brilliant preachers and teachers are always asked to write their stuff down. He did. We have 350 of his authentic sermons and around 100 books/booklets. They include apologetic works to debunk various heresies, commentaries on books of the Bible, texts on Christian doctrine, one of which was called “On Christian Doctrine.” His work, “On the Trinity,” is considered by many theologians to be the masterpiece that forever defined “Great theological writing.” Augustine is best known for his (Confessions), the personal account of his early life and conversion, and the City of God which he wrote to explain to Christians, badly shaken by the sack of Rome by the Visigoths in 410 that “our citizenship is not on earth.” The Confession, addressed to God as prayers is the first autobiography. Augustine introduced the concept of the “self” in the Confessions and of “history” in the City of God. He was held in such high regard that years after his death, when Hippo was sacked by the Vandals, who held to the Arian heresy that Augustine had so powerfully written against, they burned every building in Hippo except his cathedral and library. Late have I loved Thee, O Lord; and behold, you were within and I without, and there I sought you. You were with me when I was not with Thee. You did call, and cry, and burst my deafness. You did gleam, and glow, and dispel my blindness. You did touch me, and I burned for Thy peace. You have formed us for yourself, and our hearts are restless until in they find their rest in you. Late have I loved Thee, Your Beauty ever old and ever new. You have burst my bonds asunder; unto Thee will I offer up an offering of praise.